Since jumping from the Boston Globe to the Atlantic with his signature galleries of striking images, Alan Taylor has continued to regularly feature space-themed photos. This week his In Focus feature looks back at the shuttle program with 61 images -- check it out! 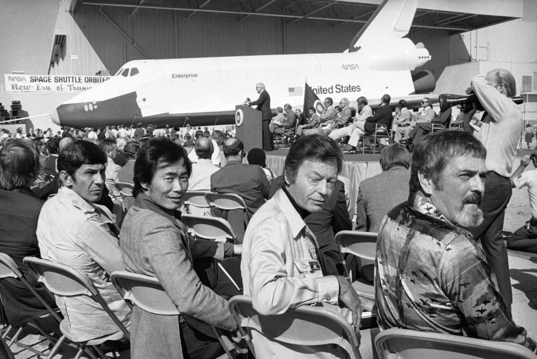 Part of the crew of the television series Star Trek attend the first showing of America's first Space Shuttle, named Enterprise, in Palmdale, California, on September 17, 1976. From left are Leonard Nimoy, George Takei, DeForest Kelly and James Doohan. This is one of 61 photos in the 'History of the Space Shuttle' retrospective image gallery at the Atlantic's In Focus.